The Washington Naval Treaty was a treaty signed during 1922 among the major nations that had won World War I, which agreed to prevent an arms race by limiting naval construction. It was negotiated at the Washington Naval Conference, held in Washington, D.C., from November 1921 to February 1922, and it was signed by the governments of the United Kingdom, the United States, France, Italy, and Japan. It limited the construction of battleships, battlecruisers and aircraft carriers by the signatories. The numbers of other categories of warships, including cruisers, destroyers and submarines, were not limited by the treaty, but those ships were limited to 10,000 tons displacement each. Only two of these ships relate directly to the WNT while the two show the different trends and designs that were considered at the time. The G3 battlecruisers were a class of battlecruisers planned by the Royal Navy after the end of World War I in response to naval expansion programmes by the United States and Japan. The four ships of this class would have been larger, faster and more heavily armed than any existing battleship (although several projected foreign ships would be larger). The G3s have been considered to be proper "fast battleships" since they were well-balanced designs with adequate protection. Nonetheless the class was officially designated as a "battlecruiser" due to their higher speed and lesser firepower and armour relative to the planned N3 class battleship design. The G3s carried nine 16-inch (406 mm) guns and were expected to achieve 32 knots (59 km/h; 37 mph), while the N3s would carry nine 18-inch (457 mm) guns on the same displacement at the expense of a slower speed. The G3 design was approved by the Board of Admiralty on 12 August 1921. Orders were placed in October, but were suspended in mid-November shortly after the beginning of the Washington Naval Conference which limited battleship sizes. The orders were cancelled in February 1922 with the ratification of the Washington Naval Treaty which limited construction to ships of no more than 35,000 long tons (36,000 t) displacement. The N3 class was a dreadnought battleship class designed for the Royal Navy after World War I, incorporating lessons learned from that conflict. They were similar in design to the G3-class battlecruiser, but had larger 18-inch guns and thicker armour. They were never ordered due to signing of the Washington Naval Treaty in 1922, which limited the size and armament of battleships to 35,000 long tons (36,000 t) and no gun bigger than 16 inches (406 mm). HMS Incomparable was the name given by Admiral John "Jackie" Fisher to a proposal for a very large battlecruiser which was suggested in 1915. Despite research into the concept, it was never to enter the design stage nor was it to come close to being built. Incomparable was suggested as the logical conclusion of this trend. By the standards of her time, she would have been a mammoth vessel. Her intended displacement of 48,000 tons dwarfed the newly built Revenge-class battleships (28,000 tons). No British battleship or battlecruiser would be built of that displacement until HMS Vanguard, which was completed after World War II. This large hull was intended to accommodate engines capable of immense speed and sufficient fuel to give a prodigious range, coupled with armament and ammunition greater than anything before sent to sea. The 20-inch guns which were planned for Incomparable were bigger than the largest guns ever installed on a warship (the 18.1-inch guns of Yamato): 20-inch guns were ultimately only ever to be used on paper. 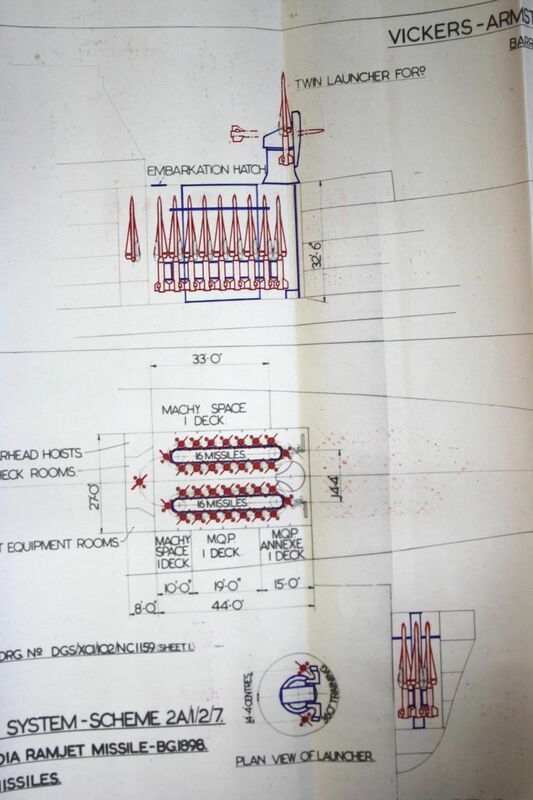 The 18 inch gun tested on Furious was used on monitors during the war, from which complaints were occasionally voiced that it 'caused a shower of sheared off rivet heads' whenever fired. Just as remarkable as the firepower intended was the speed of the ship: if Incomparable had been capable of the 35 knots intended, she would have been faster than almost any battleship or battlecruiser built historically, and indeed faster than many cruisers or destroyers. 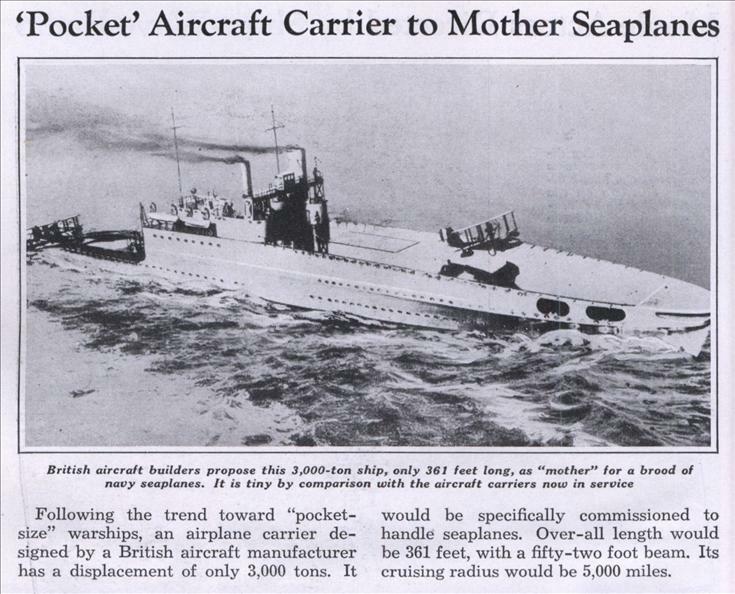 She was expected to have a life span of no more than 10 years; Fisher expected her design to be quickly surpassed. As a warship, Incomparable would have been of dubious tactical value. Her construction would have been a very great expense, and her armour relatively weak. The Royal Navy's experience at the Battle of Jutland in 1916, where three of Fisher's battlecruisers were destroyed, resulted in a decisive turn away from the 'large light cruiser' concept and towards the 'fast battleship'. The subsequent design of battlecruiser, the Admiral class, ended up incorporating much heavier armour but retained the proven 15-inch guns. Only one, HMS Hood, was completed, with the rest scrapped in 1919. The following class intended (but also never built), based on the G3 design, was a battlecruiser only in relation to the paired N3 battleship. It has been speculated and proposed that if HMS Incomparable had been built she would have ended up as an aircraft carrier like HMS Furious or the American battlecruiser USS Lexington. 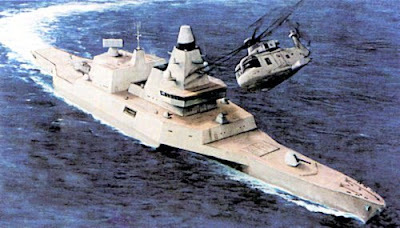 This design as proposed stands in opposition to the previous designs of bigger and larger warships. It illustrates the design trend after the WNT of pocket warships. Though once rearmament for WW2 started such concepts fell by the way side. Throughout the 1950s and 60s Britain experimented and trialed out different atomic/nuclear reactor designs along with potential applications. While the Royal Navy looked at using reactors in surface ships in the end they would be used only in attack/ballistic missile submarines. 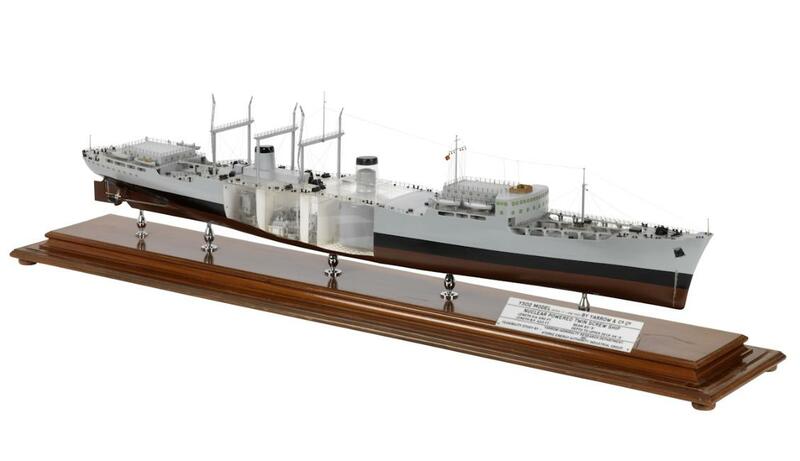 This model was made as part a joint feasibility study by shipbuilders Yarrow & Company Ltd., the Admiralty Research Department and the Atomic Energy Authority Industrial Group, into a nuclear powered Royal Fleet Auxiliary ship (1965). The midship areas of both sides of the model and the midship deck and superstructure have all been exposed and ‘glazed’ over with transparent material, possibly thin perspex. The large cutaway section allows the internal compartments and machinery, including the nuclear plant, to be viewed. The forward of the two funnels, and other deck-mounted features, have also been partly made from a clear material. Where the midship section of the deck itself has been rendered transparent, fittings such as winches have been placed upon it in their correct positions. The more conventional features of a replenishment tanker, like the fuel booms, can be seen, too. The advantages are obvious of a fleet replenishment tanker that can remain at sea indefinitely. The label or sign on the model simply states that it is a Nuclear Powered Twin Screw Ship giving dimension details and other model details. The basic design of this ships was adopted from the basis for the RFA ol-class tanker. 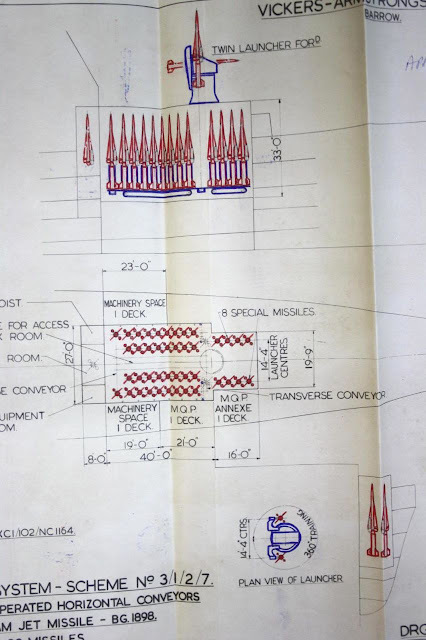 In the late 50's the RN began looking at a follow on the county class destroyers, the missile system that was selected was New Naval Guided Weapons System (to become known as NIGS) NIG's. The MoA called it WA726 and it was to be developed by the Project 502 team lead by Armstrong Whitworth and including Smiths and Sperry. it was to be based on a highly evolved Sea Slug. The project was started in 1958 and by late 1959 it was envisaged as a semi-active homing dart weighing 0.64 ton with 0.83 ton booster. 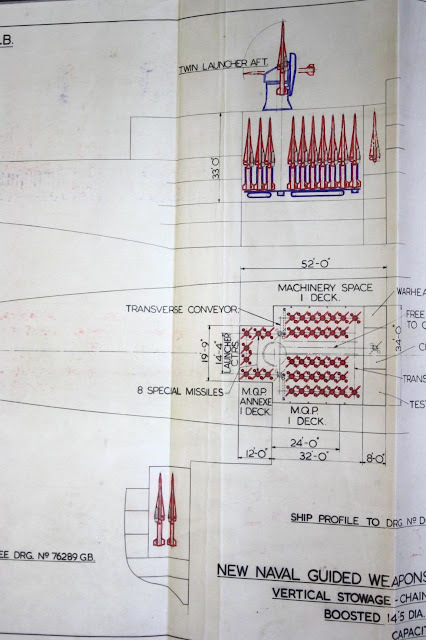 The ship to carry went through a range of sketches culminating in designs of approximately 8,000-9,000 tons carrying up to 80 missiles. Proposed powerplants were combined nuclear and steam and full nuclear. None of these platforms or systems got beyond the initial sketch and discussion stage. The ships radar was to be the Type 985 tied to the ADAWS system that first appeared on the Batch II counties. 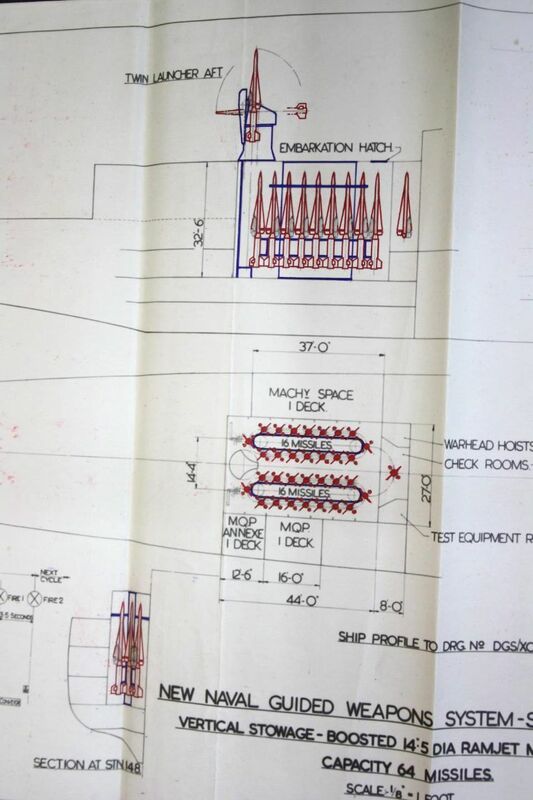 These images are from the secret projects forum and the originally uploader in 2013 obtained them from the national archive at Kew. Due updates, transfer and maintain on the forum they are no longer available. These are copies I downloaded. 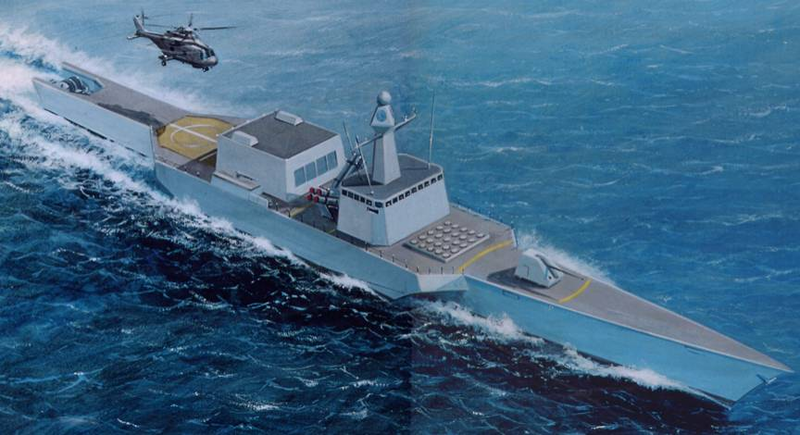 The NIGS missile and platforms didn't get beyond the design stage due to budget and technical advances. Key being the move from value computers to transistor based ones. 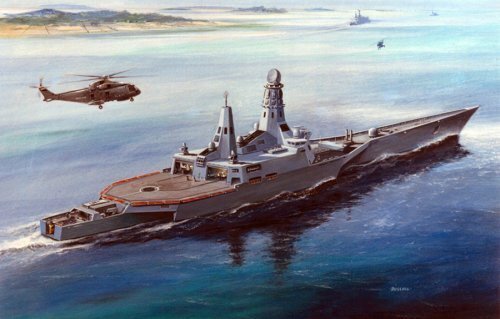 So NIGS was replaced by Sea Dart which could carry out the same planned role but be far smaller. During various points through the 60s, 70s and 80s. 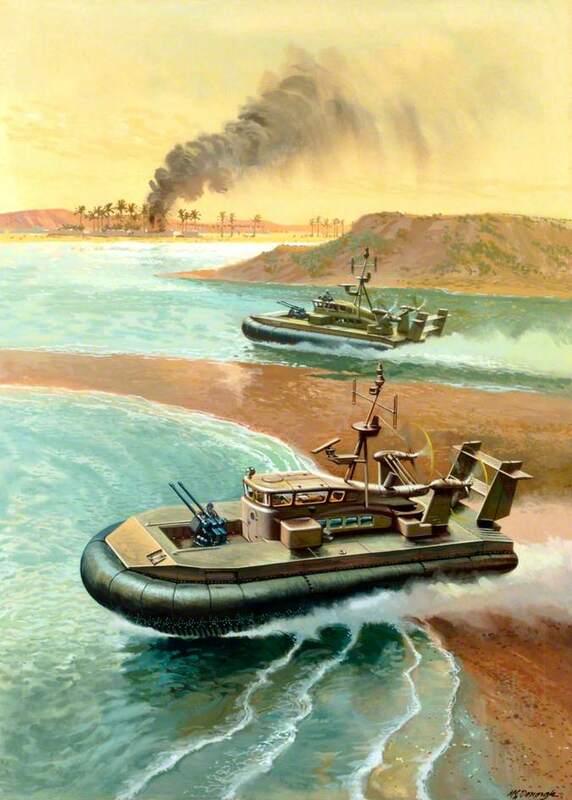 The Royal Navy and Marines trialed out hovercrafts for various roles though none would enter full service. 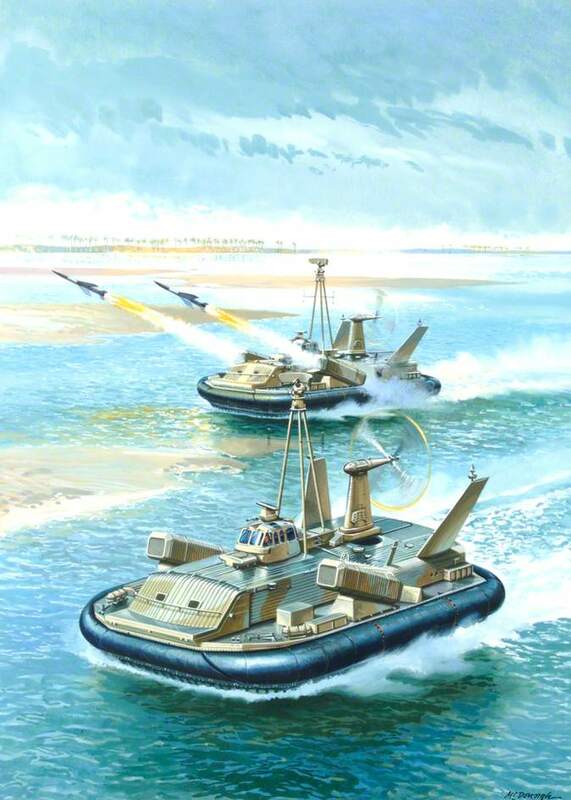 The Royal Navy considered a mine sweeping version of the SR.N4, hovercraft being almost invulnerable to mines. 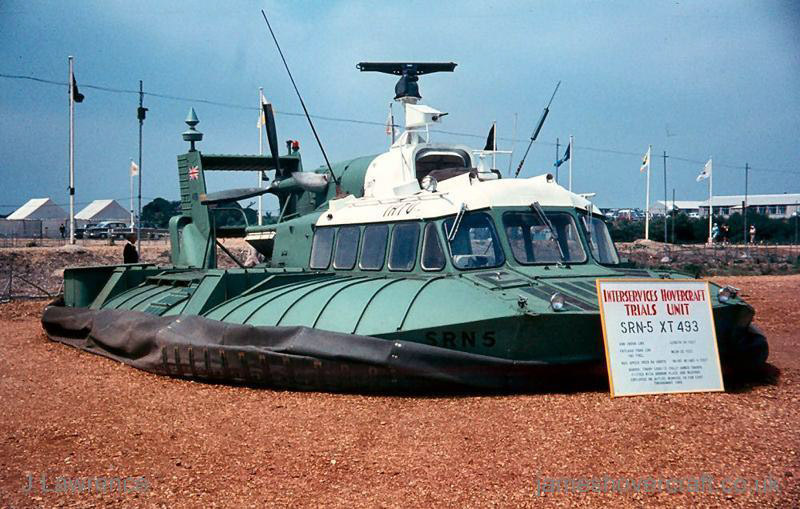 This never got further than the concept stage, although an SR.N3 was used by the Inter-Service Hovercraft Unit for trials. 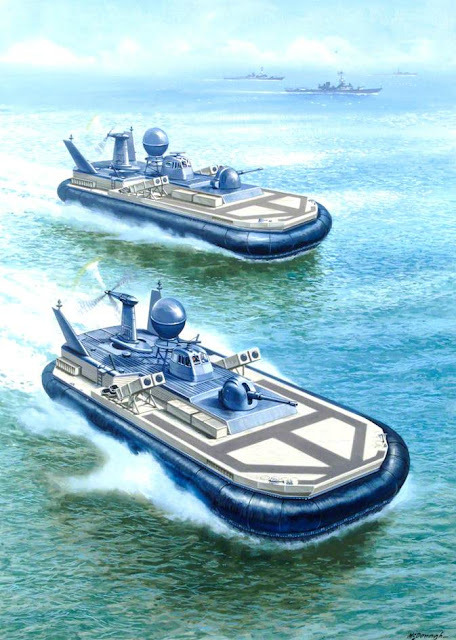 Four SR.N5s entered service with the Interservice Hovercraft Trials Unit at RNAS Lee-on-Solent (HMS Daedalus) for trials and operational missions. 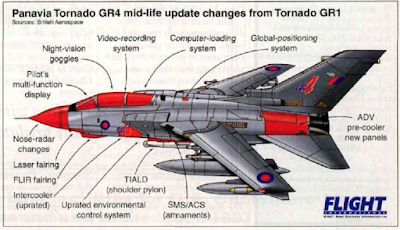 Given the military aircraft serial numbers XT492, XT493, XT657 and XW246, these were deployed in the UK, Malaysia, Thailand, Aden, Libya and Belgium. Two were subsequently converted to SR.N6s. The British Royal Marines operated SR.N6 XV589 in The Falkland Islands in the late 60's early 70's to evaluate them for use in remote regions. 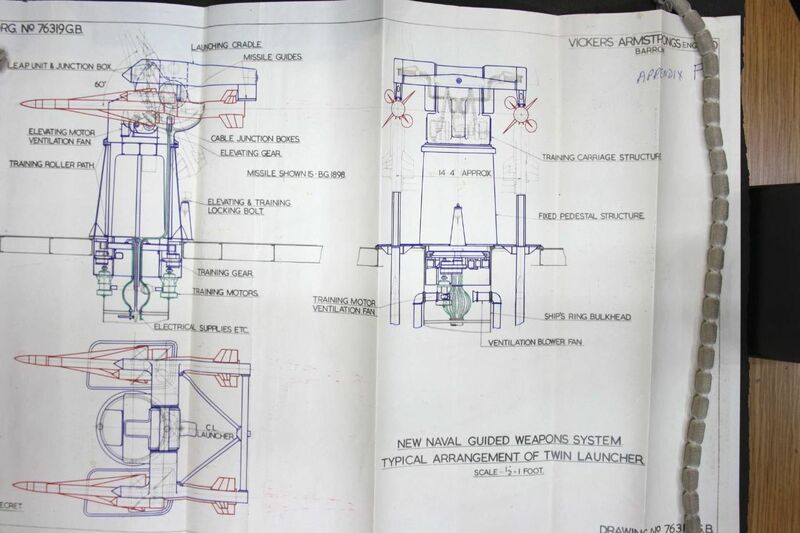 Designs were also developed for other roles as well. 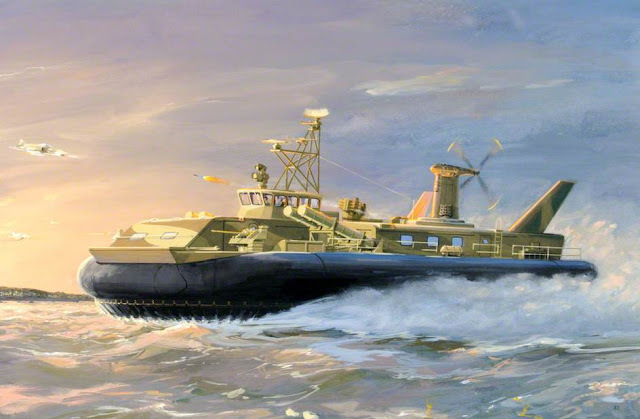 The British Hovercraft Corporation BH.7 (also known as the Wellington class) was a medium size hovercraft intended for military roles. The prototype BH.7 Mk.2 first flew in November 1969 and was evaluated by the Royal Navy, being allocated the pennant number P235 and aircraft serial number XW255. 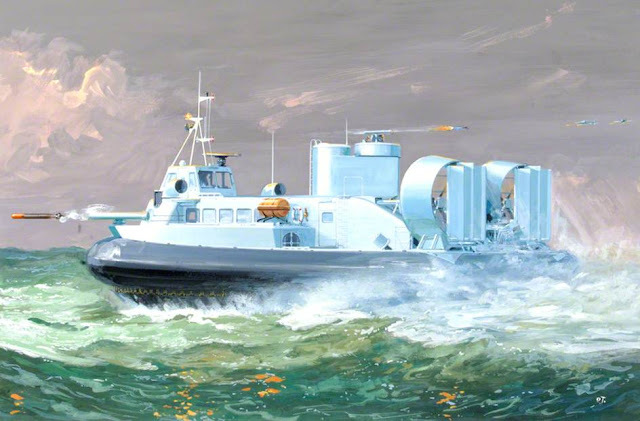 It was trialled in a number of different roles from 1970 until 1983, including mine countermeasures, fisheries protection, and anti-submarine warfare, operating from RNAS Portland, It was later acquired by the Hovercraft Museum at Lee-on-Solent. 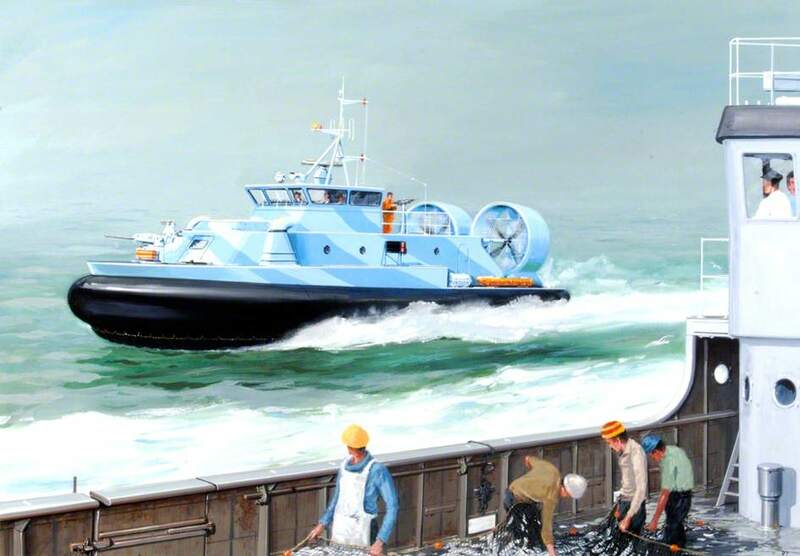 The British Hovercraft Corporation AP1-88 is a medium-size hovercraft. In a civil configuration, the hovercraft can seat a maximum of 101 passengers, while as a troop carrier, it can transport up to 90 troops. When operated as a military logistics vehicle, the AP1-88 can carry a pair of Land Rovers, a Bv202 tracked vehicle and trailer unit or up to roughly 10 tons (10,000 kg) of cargo. 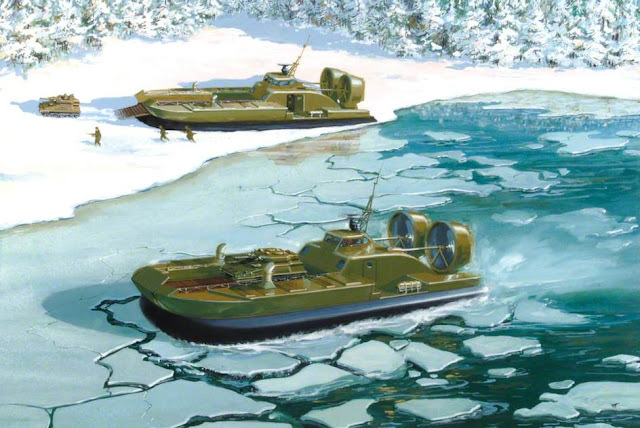 The AP1-88 had several advantages over earlier hovercraft in terms of its increased fuel economy and reduced noise output, which is principally due to the decision to power the craft using several diesel engines instead of using gas turbine engines, the latter having been used on earlier craft. It was proposed for numerous military roles. During the 90s studies first carried at UCL then by the MoD DERA (now QinetiQ) examined the use of trimaran hull-form for warships. First as a replacement general study but then as form to replace the type 22 and type 23 frigates. 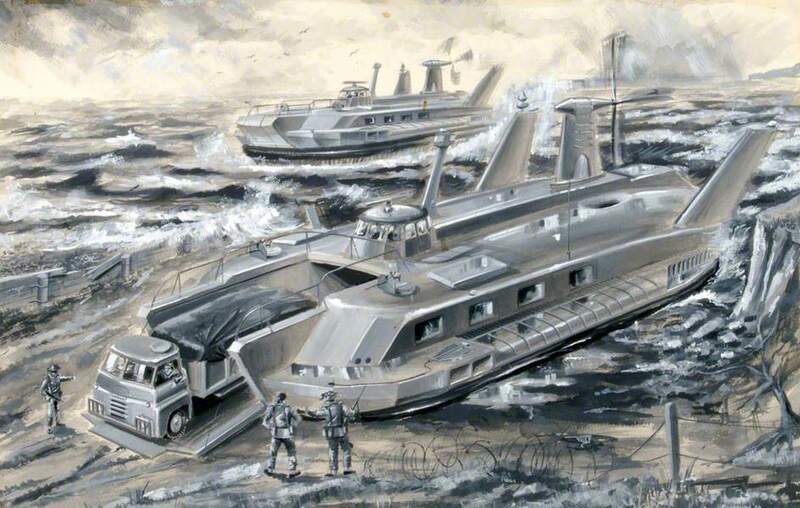 in August 1998, the MoD awarded a contract to Vosper Thornycroft to construct a trimaran, at a cost of £13.5m. RV Triton was launched in May 2000 and delivered in August 2000. Triton then began a two-year risk reduction trials programme for the MoD and the US Department of Defense. Triton was designed as a demonstrator to prove that the trimaran concept would work successfully in a large warship. Following her launch in 2000, the ship began an extensive series of trials in 2001, which covered general ship handling, performance, sea-keeping behaviour, but also areas more specific to its design for which the Royal Navy had no experience. For example, a series of docking manoeuvres were undertaken by the pilot boats of HMNB Portsmouth to determine the problems of docking a large trimaran, and the ship underwent underway replenishment alongside HMS Argyll and the tanker RFA Brambleleaf to ascertain the characteristics of a trimaran and a monohull replenishing at the same time. 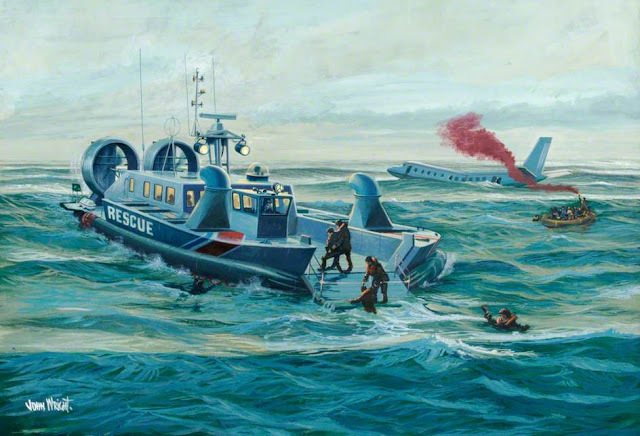 Triton also undertook the first helicopter take off and landing on a trimaran. 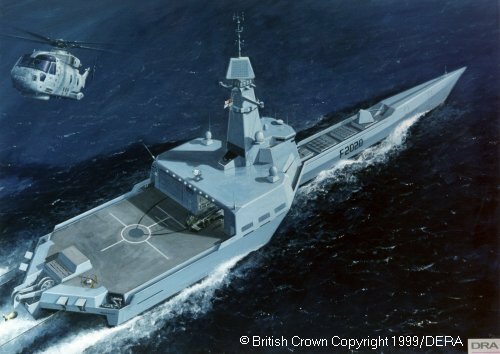 The Royal Navy in the end decided not pursue a trimaran warship though the US Navy used the form for on their Literal Combat Ships. Also, during the course of the designs studies into trimaran warships DERA did produce whole fleet concepts. 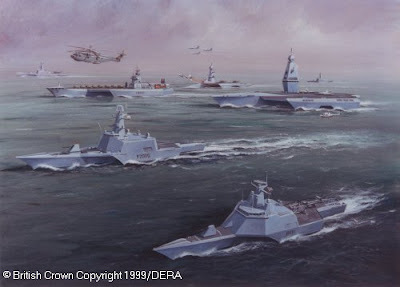 While I find these as impressive futuristic designs one of the reasons that the Royal Navy have remained with conventional hull forms is that the dockyards, shipyards and bases are all optimised for ships of a certain size and shape. So it would it cost even more to switch over to more radical designs. This also restricts the size of the largest ships the Royal Navy can operate. Which is why when American aircraft carriers visit Portsmouth they cannot enter the harbour or base itself but remain moored in the Solent.